Europe was tired of war after 25 years of nearly constant war centered around the changes that were happening in France. For this reason, a conference of ambassadors of Europe was held in Vienna Austria and was led by Metternich. While this doesn’t seem like a big deal, the meeting of leaders was a very abnormal thing to happen, so this has become a key point in history. The group wanted to make Europe more stable by creating a balance of power in Europe that would make sure no one country would have that type of power again. Another aspect of this was to try to stop the spread of revolutionary ideas, but this aspect of their decisions would fail. Representatives from 5 major monarchies and 216 noble families would show up in an effort to help make decisions. Among the hundreds of leaders at the conference, the “4 Great Powers” (Austria, Britain, France & Russia) would be the leaders that really mattered in the decision-making. 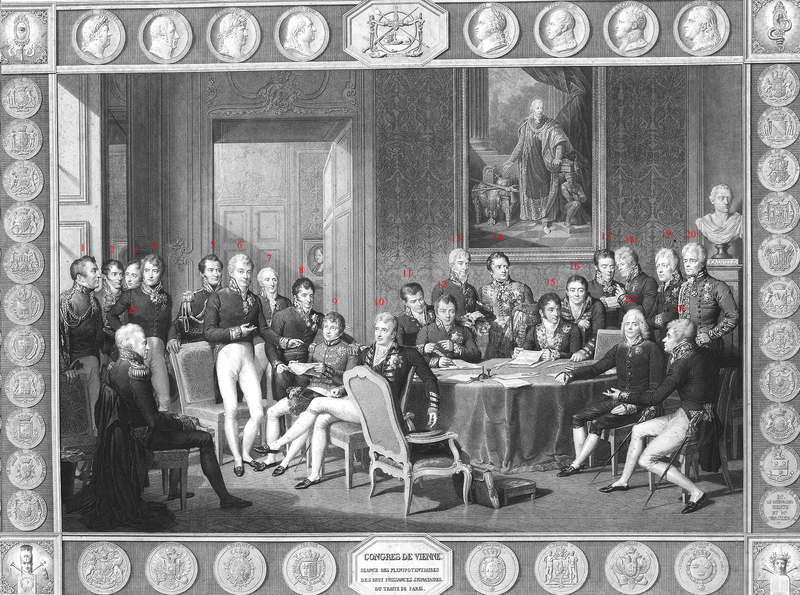 Most of the leaders would try to keep France from being a part of the negotiations, but Talleyrand would eventually talk people into allowing both France and Spain to be a part of the leadership. This changed the “4 Great Powers” to the “Big 6” in terms of who was really in charge here. The final decision was made a few day before the Battle of Waterloo (1815). what to do with what used to be the Holy Roman Empire. A German confederation was created based on 38 states (from 300 original states), and they guaranteed the neutrality of Switzerland (something that is still happening there). Austria was able to gain 50% more land due to Metternich, and many colonies outside Europe would change hands in the deals. The most controversial issue would be how to deal with Poland, since the Polish hated the idea of being given to Russia. This became such a controversial debate that Tsar Alexander challenged Metternich to a duel over the debates. In the end, most of Poland was given to Russia, but they gave Polish land to others also in an effort to reduce Russian power. The most important decision made during this was the alliances that were created to keep the balance of power in Europe. This alliance system, known collectively as the Concert of Europe, was supposed to stop invasions through a complex web of alliances that would make any invasion lead to a much larger war. In theory, any country that invaded another would be at war with a large contingent of European nations due to the alliances, thus theoretically stopping any invasion. While this meeting did keep Europe in relative peace for nearly a century, it is considered a failure because the alliances would prove to make WWI larger than it could have been. It would, however, serve as a model for later groups like the League of Nations and the United Nations. Most historians condemn the decisions as too conservative and focusing solely on stability instead of long range changes. These moral explanations come from people who had the benefit of hindsight and view the decisions to keep civil rights from the people as completely negative, so they must be taken with a grain of salt since they are somewhat biased.